Play kitchens for kids are a must have toy for every child! 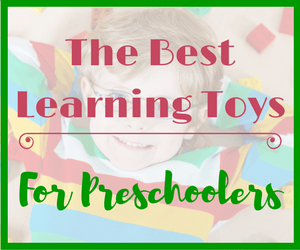 This one toy can do so much for your child’s development, including vocabulary building, problem solving, social skills, pretend play, etc. 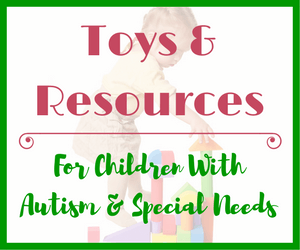 If you are crafty and love making toys for (or with) your kids then you have come to the right place! 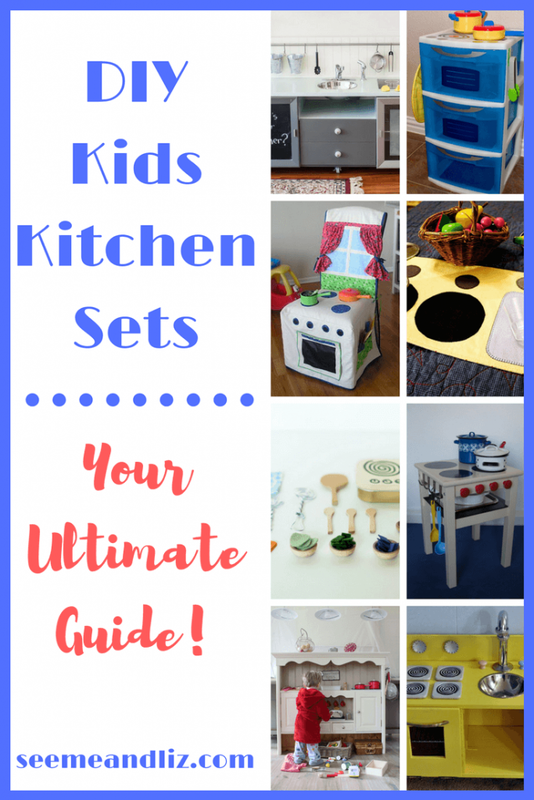 These DIY kids kitchen sets range from super simple to put together to requiring some skill and tools. 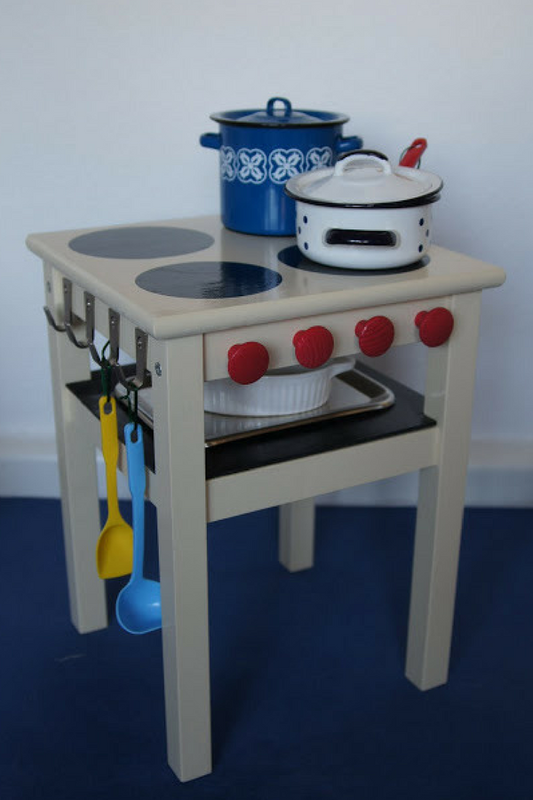 Making your own toy kitchen is a great way to re-purpose old furniture or use up some material you may have lying around. The following 2 kitchens are made using Ikea furniture. If you are like me I am sure you have at least one piece of Ikea furniture in your home. But if you don’t you may have something similar. This is actually a stove (with oven) but it’s small and won’t take up much space. If your child really likes playing with it you could always make some cabinets/counter top to go with it. It’s perfect for a toddler! Head over to Ikea Hackers for all the details. This kitchen starts with an Ikea Rast Nightstand. You will need to be fairly good with a saw and screwdriver to put this one together! But it’s perfect for a small space and a toddler. The instructions for this kitchen can be found at Spacey Casey Creates. The next 2 kitchens are made out of plastic storage bins. They are great for small spaces, especially where storage is an issue. I love this idea for its simplicity. I have seen this kind of stove on several sites and for some reason many seem to recommend making your own vinyl stickers. If you are like me this won’t be an easy thing to do because you need a machine like the Cricut to make vinyl stickers. And unless you plan on making a lot of cut outs, these machines are very pricey. But, don’t get discouraged because you can make your own cutouts with some card stock and self adhesive laminating sheets. Cut out the burners, nobs, dials using the card stock. Then make these more durable by covering them with the laminating sheets. Use a strong glue such as gorilla glue to adhere these pieces to the lid. Take a look at Pink Cake Plate for the full instructions for this “kitchen”. Although I am sure you can figure out exactly how to make this just by looking at the picture. If you did want to make vinyl stickers then you will want to read the instructions. 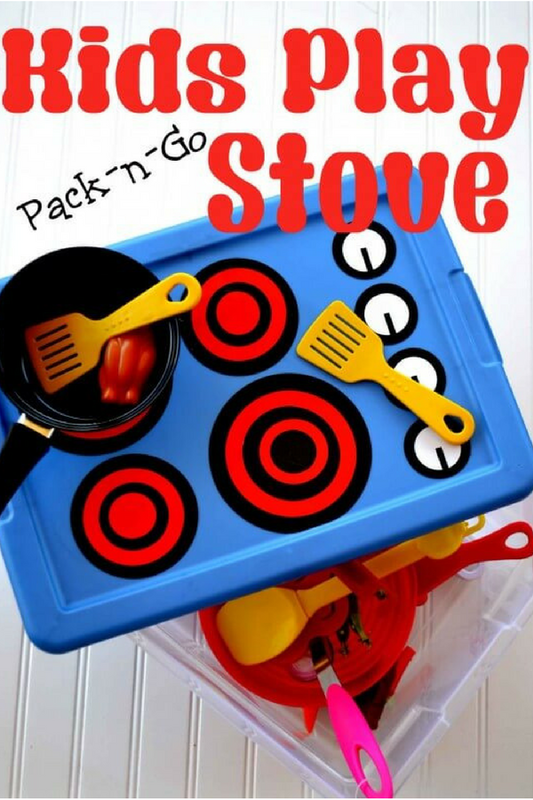 The pack n’ go kids stove would be ideal for small spaces, for traveling or to leave at Grandma and Grandpa’s house! Another great idea when space (and storage) is an issue. The storage drawer until shouldn’t cost you more than $10-$20 so it won’t cost you too much. It also isn’t very time consuming to put together. The only issue could be the fact that vinyl stickers are used. If you do not know how to make these yourself (special tools are required) you could try drawing on the unit with a permanent marker. Alternatively you could follow my suggestion from the pack n’ go stove and use cardstock, laminating adhesive and a hot glue gun or crazy glue. This idea came from Pineapples and Pinecones. There are actually quite a few instructions online that re-purpose old TV stands into kids play kitchens. You will need to have some tools, wood, paint and other accessories around for these types of kitchens. Here are 2 to give you an idea. The one pictured below is from 1 Dog Woof and uses a single level entertainment unit. Ikea has lots of these! The next one uses a larger entertainment unit that gets quite the overhaul. But the final product is amazing! I love the microwave that they added. It looks so real and will add to the playtime. You can learn more about this pretend play microwave here. Head over to Southern Revivals for step by step instructions! These tiny kitchens are perfect for little hands and will fit into most purses and bags. Instead of handing over your phone to keep him entertained, pull out one of these compact kitchens to keep him busy while you wait for appointments or at a restaurant. What an adorable idea! But you will need how to sew in order to make this one. 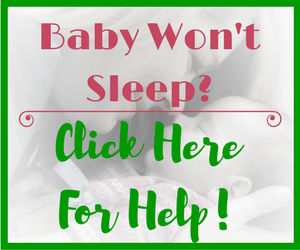 Very Mom has very detailed instructions that you can follow. If there was an award for world’s smallest play kitchen this one would win! It is extremely small and therefore perfect for a toddler. However, all of the accessories that go along with it are quite small and could easily be a choking hazard. So if you have a child under 3 that would be playing with this make sure you are always paying attention. It’s hard to tell just by looking at the picture but the stove is a mint tin! Very creative. Credit for this novel idea can be given to Made By Joel! 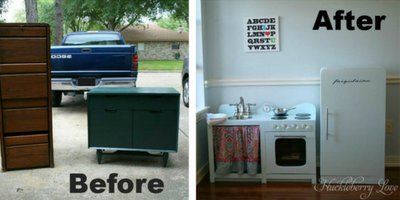 Just like the TV stand kitchens there are many options to upcycle old dressers and turn them into play kitchens for the kids. I have selected 2 different styles to give you some ideas. 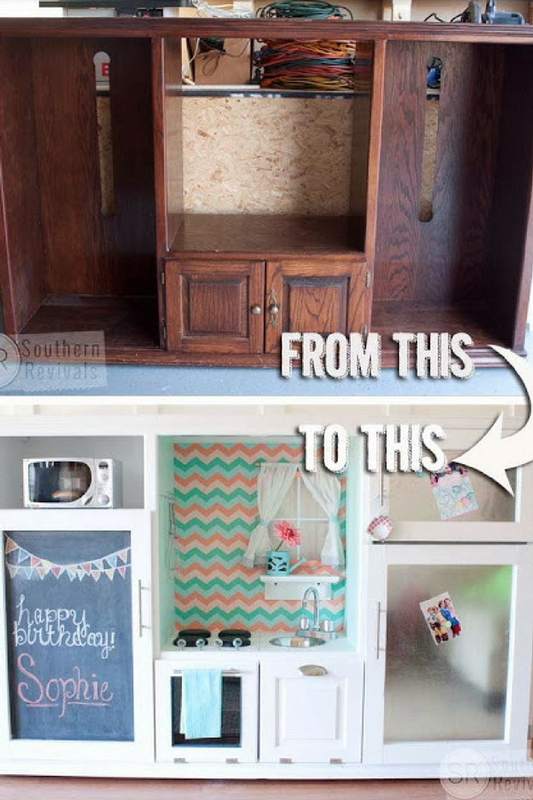 You don’t need to know how to sew or use fancy tools to make this impressive DIY play kitchen! All you need is some paint, old cd’s a permanent marker and supplies from a dollar store! Kate’s Creative Space is where you will find more information about how to put this together! 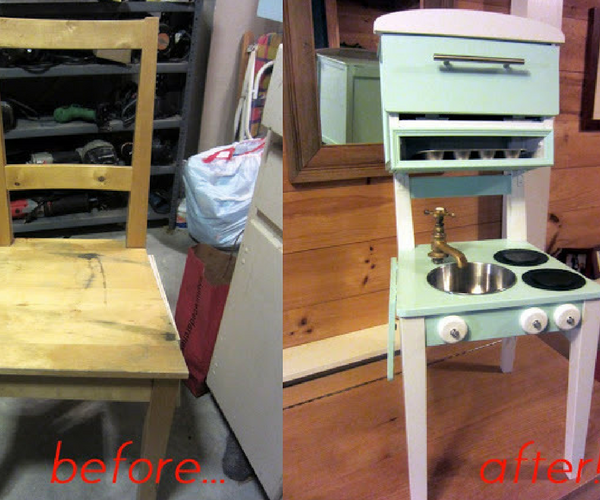 This upcycled play kitchen will take a bit of work (and skill) but the final product will make it well worth your time. Detailed instructions are available at Huckleberry Love. 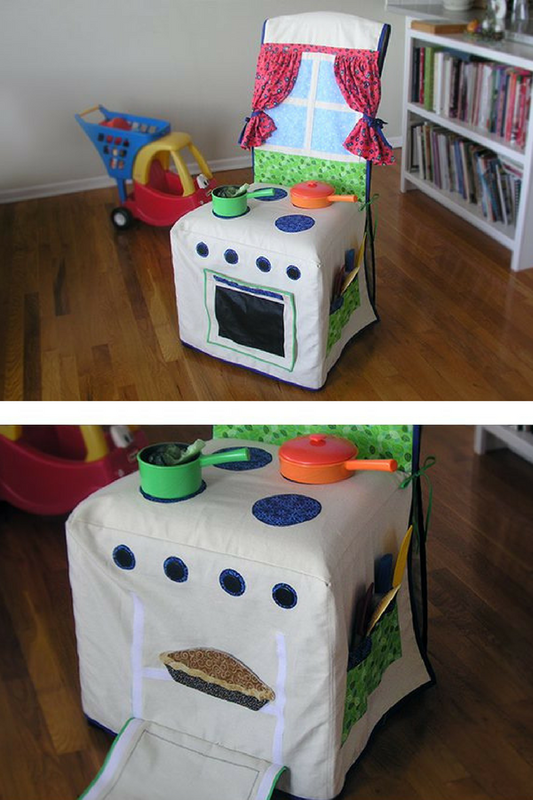 Who would have thought that a chair could be turned into a pretend kitchen for kids! If you can sew, this shouldn’t be too difficult. But don’t worry if sewing isn’t your thing. You can purchase a pre-made slipcover. The burners, window, knobs, door, etc. can be cut out of fabric and glued on (hot glue or fabric glue should do the trick) if you can’t sew. Velcro strips can be attached to the edges of the oven door so that it can open and close. The instructions for this one can be found at eHow. You read that right, use an old kitchen chair to turn it into a play kitchen for the kids. No slipcover is needed, but you will need to use some tools and paint and a few other supplies to get this chair kitchen ready! All Dad All Day has the information you will need to assemble this kitchen. 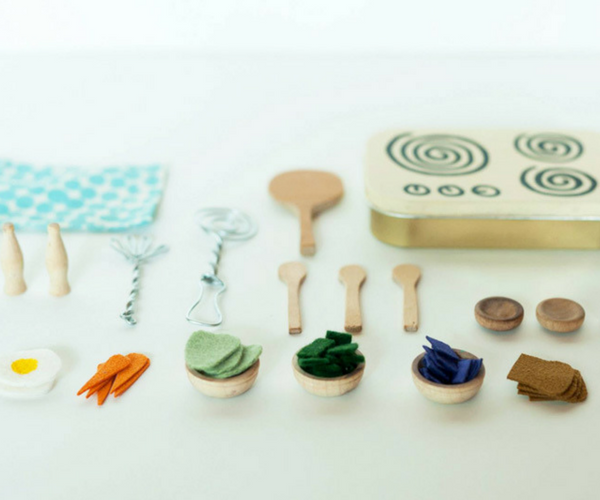 Will You Attempt Any Of These Homemade Kitchen Sets For Kids? If you are handy or crafty you will probably love some of these ideas. Being able to make a kitchen for your child will save you money and it will make this toy so much more special. But, if you are like me, it’s much easier to purchase a premade one. Although I am sure Grandma would have loved to make one of these for the kids when they were younger. It’s too bad she’s a plane ride away from us. Either way, a pretend play kitchen (homemade or store bought) is a must have toy for all children! Awesome! Toy kitchens are one of the most favorite toys in childhood. In my childhood, I had spent most of the time with my toy kitchen. My 2 year old girl would love it so much. I think this kind of pretend play kitchen is also helpful for children’s mental growth. 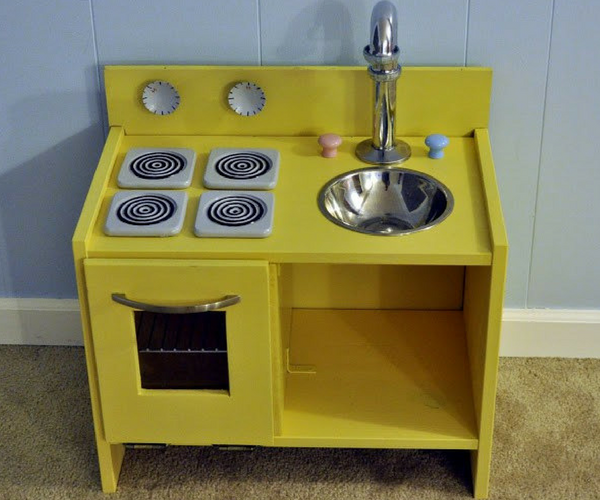 So I want to buy or even try to make a toy kitchen for my daughter. Thank for sharing these great DIY play kitchens. Thanks Jenifer! 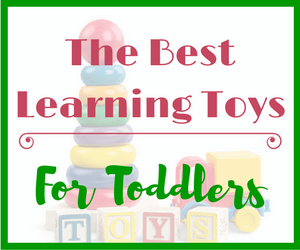 Play kitchens are a great toy for so many reasons. I’m sure your daughter would love a homemade one or store bought, if the DIY option is too much of a challenge. Be sure to check out this article in which I talk about 5 amazing play kitchens and how they can help with a child’s speech and language development! I loved this article. We visit a restaurant that has a family room where kids can get up and play with toys and one of them is a kitchen set. My little one loves to play with it, I have looked for one just like it but have not been able to find one, it is made of wood. After reading this article it makes be believe that it was made. Although I wish I would have read this article a few weeks ago I gave away some furniture that would have been perfect for this so I will be going to the swap meet or yard sales to look for some cheap old furniture that will work for this. Again great article. That sounds like such a great restaurant. There are many ready made wood kitchens out there if DIY isn’t your thing. But if you are somewhat handy then definitely give one of the kitchens in the article a try! It’s too bad you just gave away some old furniture. 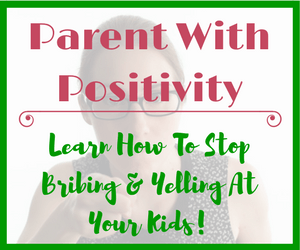 This is such a cool article! I will have to show this to my brother. He is very handy and I’m sure he would love to create something like this for the little ones. How handy does a person need to be to make these DIY play kitchens? Some of them look a bit complicated, but others seem not too difficult. Fantastic ideas and nice that they are homemade! Glad you liked the article Ruby! You do need to be somewhat handy for most of these kitchen sets as they involve using a saw, hammer, nails, screws, sewing machine, etc. But, the portable one should be fairly easy. If I were to make this (I think I might get the kids to do it with me supervising) I would use a plastic bin with a lid and then use card stock for the burners, nobs, etc. I would cover the card stock with self laminating paperr so it won’t rip or get damaged. It adds an extra layer of protection. Then use gorilla glue (or any other super glue that works on plastic, paper, wood, etc) to secure the burners and nobs. Once we get around to making one I will add some pictures to the post! Let me know if you do decide to make one of these. I would love to hear how it went! This is so awesome! My girls would absolutely love a homemade play kitchen! They have two already built kitchen sets and ALL the accessories already, but I know for sure they would love to help me make another one. They play with them so much, it’s one of those toys that was definitely NOT a waste of money. I think all kids love a good old play kitchen. Gosh only if I had the time, I would definitely try to build one. It’s just too bad I am not that handy. Maybe one day. That’s great Charlie. I love hearing about kids playing with their pretend kitchens! You could start by trying one of the more straightforward diy play kitchens. Like the storage bin one. The kids could help make it! Let me know if you do try to make one. I’d love to hear how it turned out. This post was so interesting because it shows us parents that children really should have some kind of play kitchen. They seem to have so many useful features and I believe that children are lacking in many areas including play and physical activity these days due to technology. A kitchen toy helps children to be active and use their imagination while having fun and learning at the same time. Some of these seem quite challenging to make but others are pretty straightforward. I may have to give one a try! 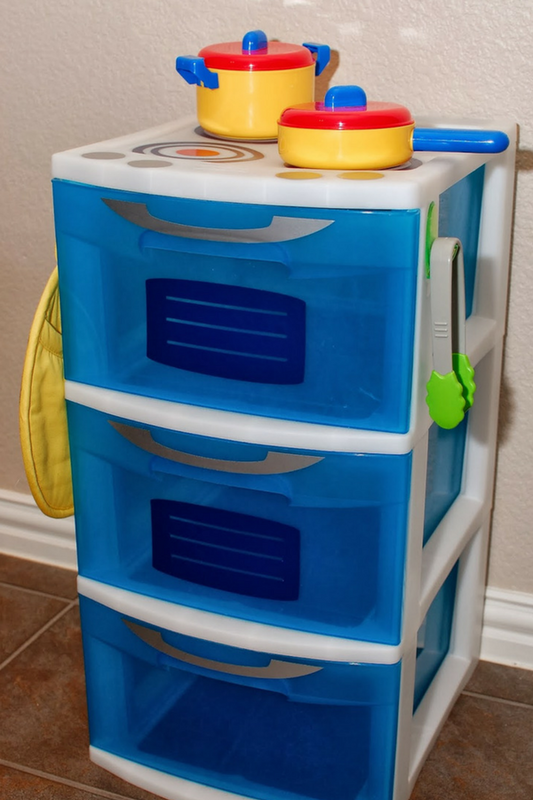 I am a bit obsessed with play kitchen sets, whether they are DIY or store bought. It is a must have toy for so many reasons. Many of which you mentioned in your comment. You might find this article of interest as I get into more detail as to why this toy is so important Kids Toy Kitchens: 10 Reasons Why Every Child Should Have One! We have plenty of kids kitchens in our house, including a wooden Ikea one. I am always amazed by how kids love to play shopkeepers for hours at a time. I have never thought to create a bespoke kids kitchen out of old furniture, but some of the images in your post are very inspiring. My DIY skills are probably not good enough, but I loved reading about it anyway. Glad you enjoyed the article Kristian! Perhaps you could try making one of the portable play kitchens out of a plastic bin. It probably wouldn’t be too complicated. I love that it can easily be used for travel and everything can be stored inside. 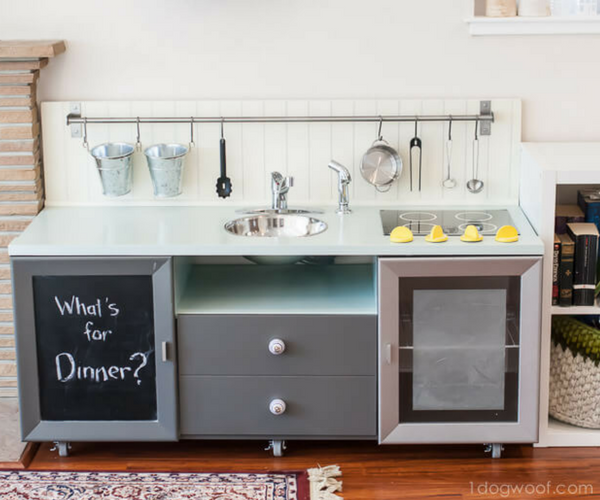 I love your blog, the diy kitchens for kids is so creative! 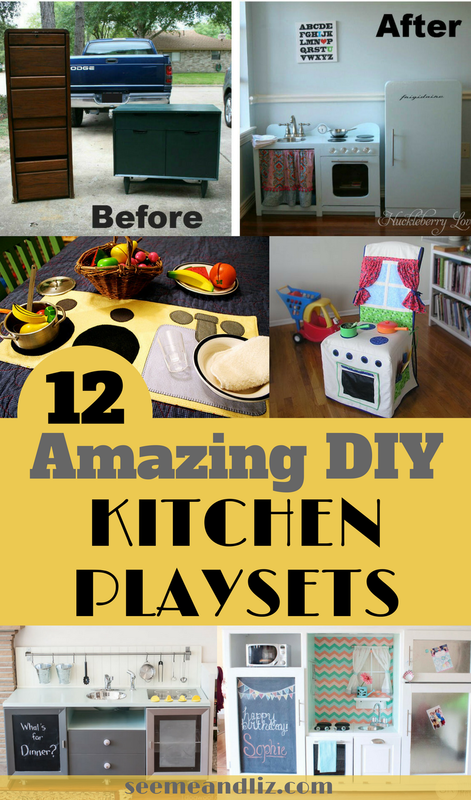 I have been meaning to get my two year old a play kitchen as I really do see the benefits but I find them expensive, these diy tips are great thank you for a great post. I am going to attempt your suggestion and provide some feedback. Thanks for your comment Helen! 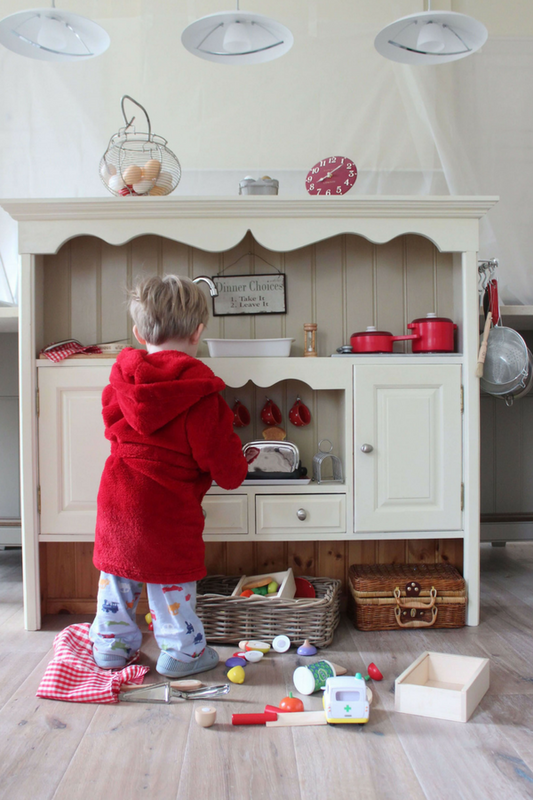 A play kitchen is a toy that will last many years, so they are well worth the investment, but if you are crafty then definitely try making one yourself! 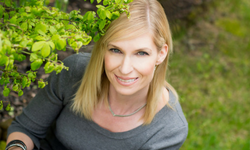 You may find these articles of interest as well! Kids Toy Kitchens: 10 Reasons Why Every Child Should Have One!